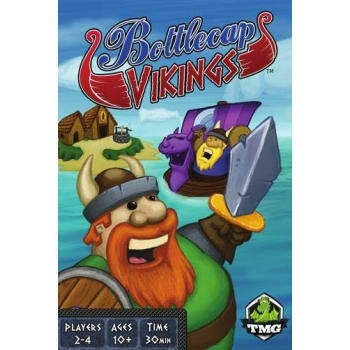 Bottlecap Vikings is a small rondel game with a ton of replayability. The rondel spaces are not fixed in place - they are randomized at the beginning of the game. Not only that, they're double-sided, so you might never play on the exact same configuration twice. There are two different victory conditions, and players each have a small "tech-tree" in their city with multiple viable paths creating tons of options for players. Furthermore, the city cards are double-sided, one side is identical for all players, and the other side is unique. To top it off, the crux of the gameplay is the push-your-luck damage system, which makes you value spaces differently depending on how damaged you or others already are!